Biosat which combined a Vostok spherical pressurized reentry capsule and a Yantar service module. 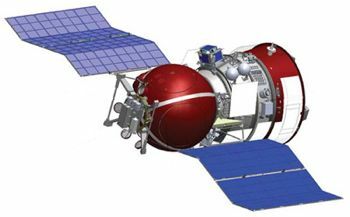 Life Science satellite built by TsSKB-Progress for Roskosmos, Russia. Launched 2013. Used Yantar Bus. Status: Operational 2013. First Launch: 2013-04-19. Last Launch: 2013-04-19. Number: 1 . Gross mass: 6,266 kg (13,814 lb). Family: Biology. Country: Russia. Launch Vehicles: R-7, Soyuz-2-1A. Launch Sites: Baikonur LC31. Bibliography: 6389, 12157. Bion-M No. 1 - . Mass: 6,266 kg (13,814 lb). Nation: Russia. Class: Biology. Type: Biology satellite. Spacecraft: Bion-M. Decay Date: 2013-05-19 . USAF Sat Cat: 39130 . COSPAR: 2013-015A. Apogee: 579 km (359 mi). Perigee: 471 km (292 mi). Inclination: 64.88 deg. Period: 95.14 min.